Little is known about the association between the metabolic syndrome (MetS) and the risk of gastric adenocarcinoma. The aim of this study was to investigate whether metabolic risk factors, together or combined, were associated with the risk of gastric adenocarcinoma. The Metabolic Syndrome and Cancer Project (Me-Can) is a pooling of prospective cohorts in Austria, Norway, and Sweden with information on blood pressure, lipids, glucose, and BMI available in 578,700 individuals. 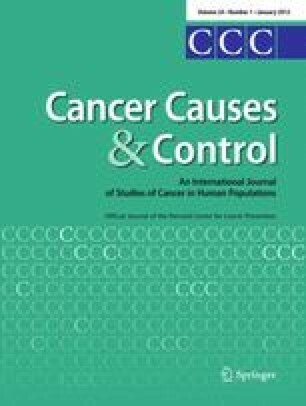 Cox proportional hazards analysis was used to calculate hazard ratio (HR) of gastric adenocarcinoma using metabolic risk factors categorized into quintiles and transformed into z-scores (with mean = 0 and SD = 1). The standardized sum of all z-scores created a composite MetS score. In total, 1,210 incident cases of gastric adenocarcinoma were identified. Glucose was significantly associated with the risk of gastric adenocarcinoma [calibrated HR 1.58 (1.14–2.20) per one unit increment in z-score] in women. There was a statistically significant association between triglycerides and risk of gastric adenocarcinoma per mmol increment in triglycerides [HR 1.20 (1.06–1.36) per mmol] but not for the adjusted z-score in women. There were no significant association between any metabolic factors and gastric cancer among men. The composite MetS score was associated with the risk of gastric adenocarcinoma in women [HR 1.18 (1.00–1.38) per one unit increment in z-score] but not in men. Glucose and high levels of the composite MetS score were associated with an increased risk of gastric adenocarcinoma in women but not in men. Financial support was provided by the World Cancer Research Fund (Grant 2007/09), The Swedish Research Council, The Ernhold Lundström Foundation, The Einar and Inga Nilsson Foundation, The Malmö University Hospital Cancer Research Fund, The Malmö University Hospital Funds and Donations, The Crafoord Foundation, the Mossfelt Foundation, and the Swedish federal government under the agreement concerning research and education of doctors in Västra Götaland, Sweden.